The Windows clipboard holds only one piece of text at a time. AceText holds as many as you want (a thousand by default) in the ClipHistory. Whenever you cut or copy text, AceText captures it into its clipboard history. AceText saves your clips even when you reboot your computer. Never again lose important data because the Windows clipboard can hold only one chunk of text. Double-click any clip to quickly paste it anywhere you want. Turn on SequencePaste to quickly paste many clips in succession, without switching back and forth between different applications or AceText. Rapidly transfer data from one application to another by first copying all snippets in the first application, and then pasting everything into the second with SequencePaste. Or use AcePaste to quickly paste anything you copied in the past day, week or month. Use AceText's system-wide keyboard shortcuts to copy and paste without lifting your fingers off the keyboard. Summon AceText with one key press, and dismiss it with another, all while you keep focused on the task at hand. When using the mouse, drag and drop text between AceText and other applications. AceText provides swift assistance without getting in your way. "I use AceText extensively, refer to it as my magic clipboard, and suggest people should use it at every opportunity. I'd be lost without my EditPad and AceText." 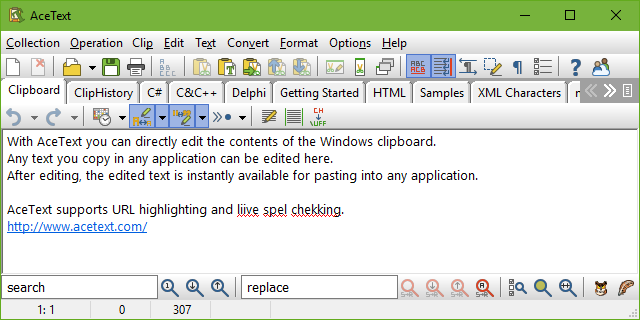 AceText extends the Windows clipboard, enabling you to cut, copy and paste like never before. AceText enables you to view and even edit the text held by the Windows clipboard. AceText automatically updates its clipboard viewer whenever you copy something to the clipboard. 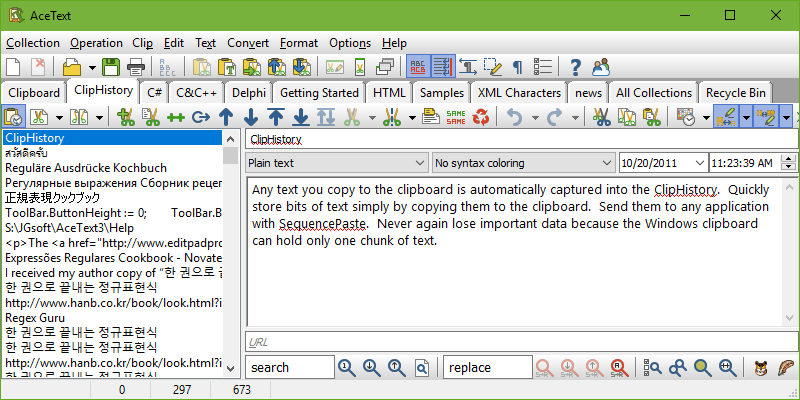 AceText's clipboard viewer is actually a full-featured text editor. Very handy to quickly edit some text in an application or web site with input fields that are too small or offer limited editing abilities. Just copy the text to the clipboard, edit it in AceText, and paste it back into the application or web form. "I’ve been a user for several years. I use AceText constantly every day and find it absolutely invaluable. I don’t see how people get by without a clipboard manager and this is the best I’ve found." "I purchased AceText a few weeks ago, and it is already well integrated with the way I work. The concept is so simple, it's the way that Copy & Paste should have been designed, to begin with. There are very few keystrokes involved, for a marked increase in productivity. Some of the tasks which you would consciously have to perform with a PIM, are done transparently in the background, but much more conveniently. I'm so sorry I didn't Google this years ago."